You won't want to dance4life after hearing this. It's nice when famous celebrities give back to their community, especially considering the fact that we have allowed them to amass large amounts of fame and fortune with every work of "art" that they release to the public. One of the primary ways is through donations or activities to support a charitable organization. Such is the case with megastar trance DJ Tiësto. Known across the globe and often voted as the #1 DJ in the world, Tiësto receives much media coverage and thus would be an excellent medium for spreading the word about charity. In 2006, it was requested that he become the official spokesperson for the Dance4Life Foundation, a Netherlands-based organization dedicated to improving world awareness of HIV and AIDS. Upon accepting this honour, he released a single with the intent of raising money for this very charity. It was a solid gesture. But it doesn't help when your musical contribution to the organization is absolute trash. All I really need to do is listen to the Radio Edit to know that something is amiss. 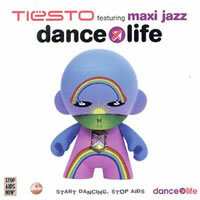 Tiësto is not widely known for minimalist music, which is one reason why Dance4Life is so awful. There really isn't anything to it. Reminds me an awful lot of that one song everybody liked but now nobody remembers... errr... *checks Wikipedia* "Drop It Like It's Hot" by Snoop Dogg. Remember that one? And how, aside from a 3-second synth riff, there was basically absolutely nothing to the song? That's exactly the same situation here, except that I liked the riff from Snoop's tune. This one is uninspired and whatever synth setting Tiësto used should be deftly removed. Tiësto collaborated with Maxi Jazz from the popular electronic band Faithless for the vocals. It's nice that he picked someone relevant within the dance music industry to join him, but Mr. Jazz's vocals just don't fit the song. In fact, they're a bit depressing, and not because he's speaking out against gunfire and AIDS. Plus he doesn't really sing at all, so it's more like a spoken word single with some standard trance beats backing him up. Nothing to write home about. Ah, and sadly, the 12" Mix just elongates the pain, and it never gets any better. All I can really say to sum up this release is that, despite acting as a representative for the Dance4Life Foundation, Tiësto did not put his full energy into this single. In fact, the track reflects about an hour's worth of his precious time. Don't people in need deserve better? The answer: yes, they do.